This model has been validated by Penny Noble of Oxford University and is known to run in COR and PCEnv. ValidateCellML verifies this model as valid CellML, but detects unit inconsistencies. The ionic mechanisms underlying many important properties of the human atrial action potential are poorly understood. Using specific formulations of the K+, Na+ and Ca2+ currents based on experimental data recorded from human atrial myocytes, along with representations of pump, exchange and background currents, Marc Courtemanche, Rafael J. Ramirez and Stanley Nattel developed a mathematical model of the action potential (see the figure below). A schematic representation of currents, pumps and exchangers included in the model. 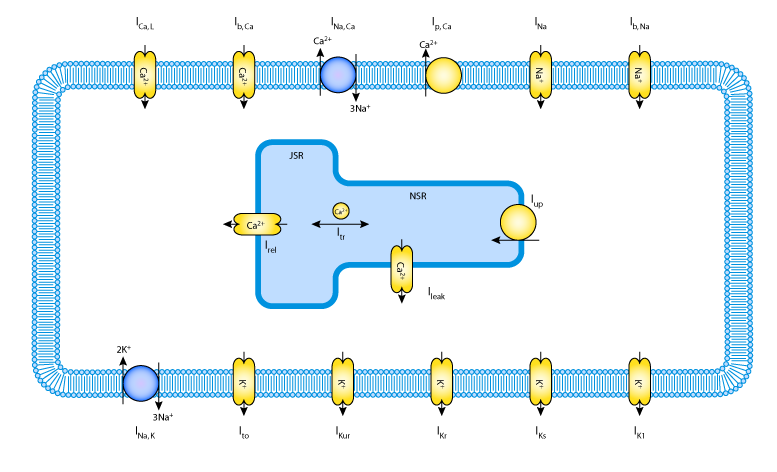 The cell includes three intracellular compartments: cytoplasm, sarcoplasmic reticulum (SR) release compartment [junctional SR (JSR)], and SR uptake compartment [network SR (NSR)]. Derived from workspace Courtemanche, Ramirez, Nattel, 1998 at changeset c26e4d53792b.